The Sketching in Hardware 2 conference was a blast. So many interesting people and ideas. I wish we could have it every few months. Mike has his notes and a good summary of this year’s Sketching. My talk was on “Smart Interface Components”. It was a generalization of the things I’ve been thinking about with the Smart LED prototypes. 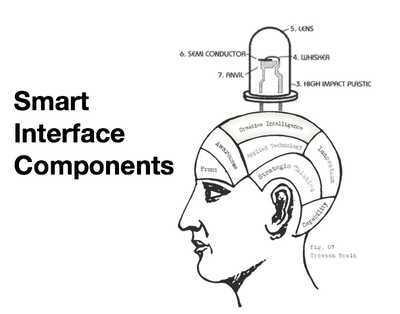 What are Smart Interface Components? Current interface components, the sensors and actuators that comprise the user interface of the gadgets we use, are dumb. They require specialized domain-specific knowledge to make work correctly, non-trivial processing to use, and in general are a pain. Tiny microcontrollers are becoming cheap enough to embed even at the edges of our hardware designs. A component with local brain can embed some of the domain knowledge and enable a higher level of communication between it and the application processor. 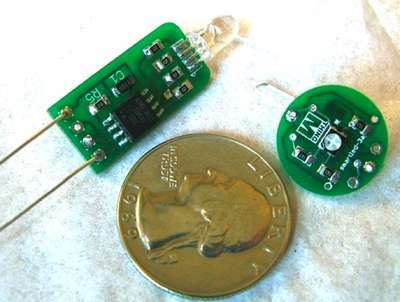 An example presented is a Smart LED. LEDs are dumb. Multi-color LEDs are hard to control. Can we make it better? 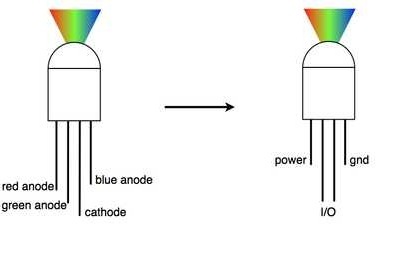 Imagine an LED that instead of worrying about PWM and current-limiting resistors, you just give it the HSV or RGB color values via a serial line? “#FFCC22 @ 20% brightness”, you say. 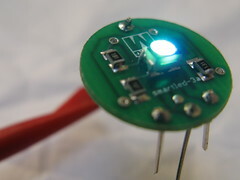 Work is continuing in making production versions of these smart LEDs. 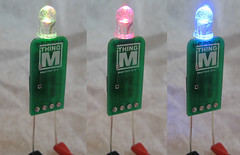 ..and ill buy what they dont :) These would take so much bother out of blinkey stuff. This is awesome. You’re totally right that these are the devices of the future. Smart, programmable devices like these can do all kinds of cool stuff. Add some input (a switch or two) and you’ve got all kinds of solutions. I’m a big “blinky” fan and want to make something just like this. DO produce these! You’ve got your first customer!